Image: Kim Crowder & P. F. White, 2019. Disliking uncertainty, I need markers - days when I know exactly what to do - so I’m strict about the Twelfth Night tradition of taking down Christmas decorations. But by February it feels like an age since I picked off the Christmas tree’s little glass fruits one by one and wound up the tinsel and fairy lights. The tree's absence leaves the house starkly colourless and all that’s in prospect is a seemingly interminable wait for spring. To help pass this time, I’ve evolved my own unofficial start‑the‑year custom, deliberately counteracting the post‑Christmas clearing out and tidying away with purposeful collecting and bringing in. The aim is to have a continuous display of spring flowers and foliage indoors. Every walk or trip into town doubles as a collecting mission. Wherever I go I’m on the lookout for early spring tokens, a sprig of this, a few stems of that. I fetch whatever I can find to keep the indoor flower displays going in unbroken succession. While it is still too soon for the first snowdrops to bloom, the sequence begins with just one or two bunches of commercially grown daffodils - flowers raised in the early warmth of Cornwall or the Channel Islands where spring arrives early. Every January I balk, initially, at the idea of spending £1.50 or more on a paltry half‑dozen short stems topped with bullet‑hard green buds. They come with no guarantee of opening into full flower, and all too often these precocious buds atrophy and come to nothing. But I always give in. Refusing to buy would mean a blank, flower‑deprived start to the year. I would miss all the pleasure of watching for the first poker‑straight stem to relax into a bend. That’s the sign that the bud is keeping its promise, and making a start on bringing in the spring. 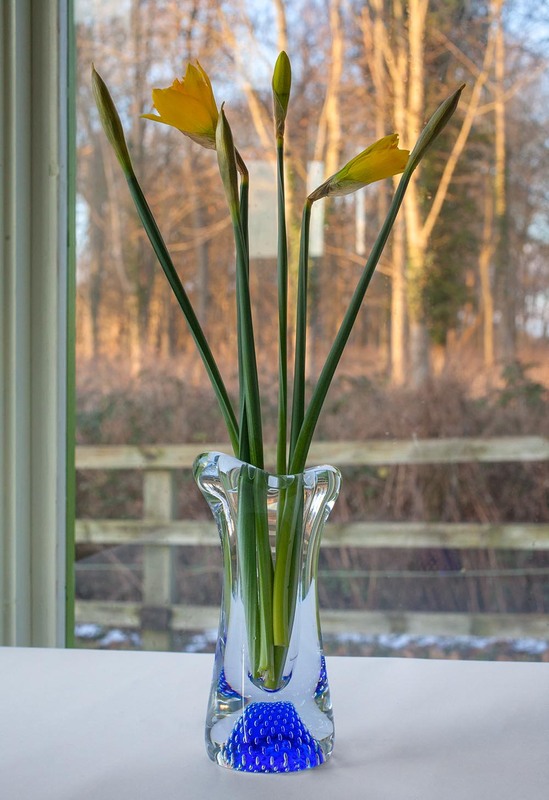 In January’s first dusks, when the fire is lit a little before five, I deliberately leave the lamps off for a while to savour the sight of flickering flames illuminating the year's very first daffodil petals. Together the flowers and the flames become part of a special magic which occurs in the interlude between fading winter twilight and full nocturnal firelight. In it, there are a few charmed moments of affinity between a special trio of colours - the intense cobalt blue of the evening sky, the amber‑red cores of burning coals, and the delicate petals’ citrines and and golds. A handful of shop‑bought flowers doesn’t stretch very far, so until the snowdrops bloom the challenge is how to make the very most of what’s available. My tactic is to boost the earliest flower displays with twigs from four of my favourite trees. In winter the silver birch sports miniature dark purple catkins, smaller than babys’ fingers, clenched tight against the cold. At this time of year, the beeches are armed to the teeth, their long elegant buds fiercely spiked as tiny daggers. A nearby weeping willow yields slender ochre‑yellow wands whose lime green buds enclose the tree’s tiny silver‑whiskered flowers. 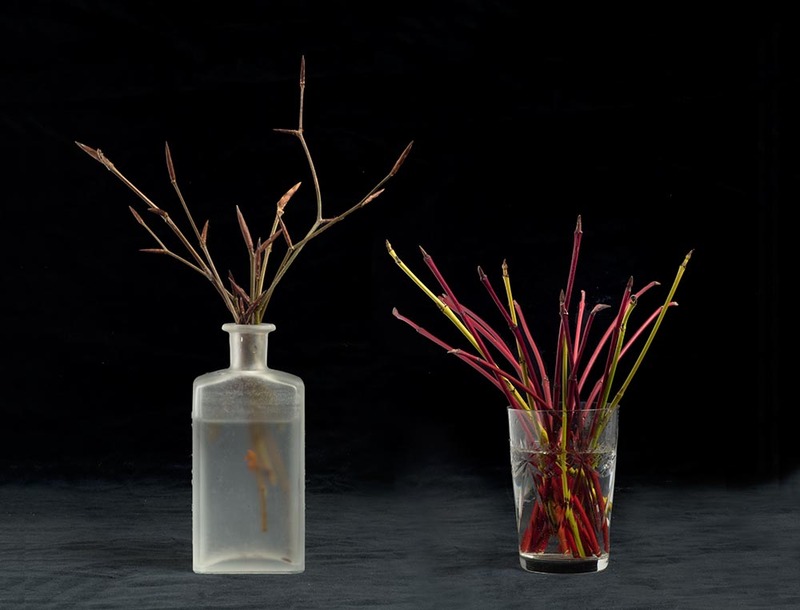 Red dogwood stems from the garden provide the richest colour complement for the other twigs’ ochres, purples and greens. The black buds that stud its lustrous scarlet stems are shaped like tiny black cat-claws. In time each room in the house sprouts its own little forest of naked twigs. Ranging from bonsai-size to ceiling‑height boughs, these temporary tree gatherings form my hedge against winter. In February more flowers come to hand. On twig‑picking forays, I happen upon snowdrops, yellow aconites, pale lavender crocus, magenta anemones, white and purple violets. By mid‑February I’m finding enough to arrange bunches, several at a time, in every room - some for both kitchen windowsills, the worktop and the table, some for the hallway, some to go on the sitting‑room mantlepiece and tables, more on either side of the bed and on the dressing table. Arrays of potted bulbs come and flower and go. Pink, blue and white hyacinths, miniature indigo irises, yellow and purple crocuses, and a spectacular amaryllis or two all take their turn. Gradually the house fills with the intensifying colours and perfumes of spring. I’ve never attended flower‑arranging classes and know none of the tricks of the floristry trade. My best ‘arrangements’ are spontaneous, happenstance, sometimes involving much more than the bunched flowers themselves. 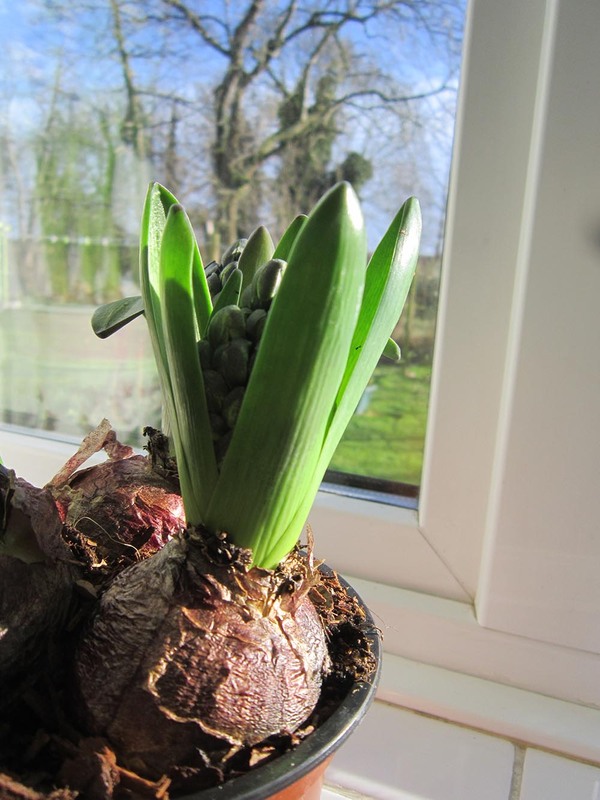 One of my favourites occurs when flourishing windowsill bulb shoots are seen against the background of a stark naked naked tree rearing up against a backdrop of brilliant silver‑lit clouds. There is such a rich contrast between the bulb’s vibrantly green flesh and the iron‑grey tracery of the skeletal winter tree. 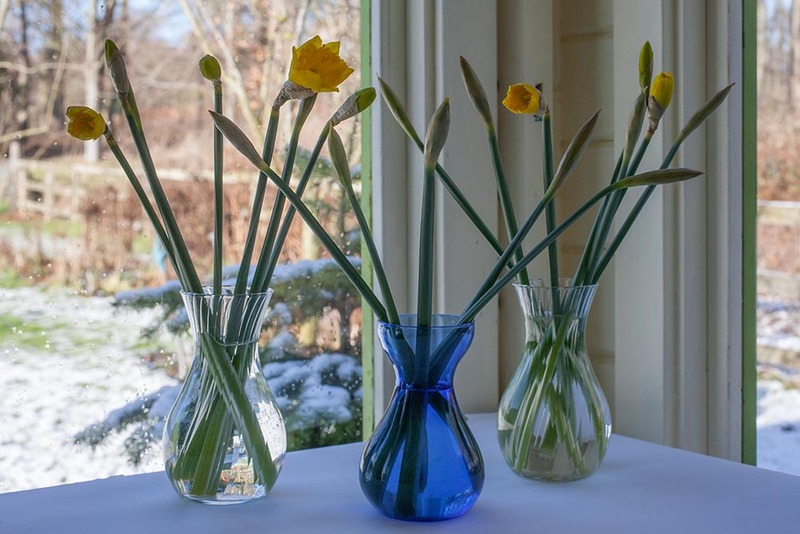 The approach of March brings days when indoor flower arrays begin to overlap and overlay the newly daffodil‑filled vistas of the garden and the wood. Seen like this, the flowers connect up what is without and what is within, what’s indoors and outdoors. They close down the gap between winter and spring. My winter flora‑scapes are less still life, more movable feast or portable garden. 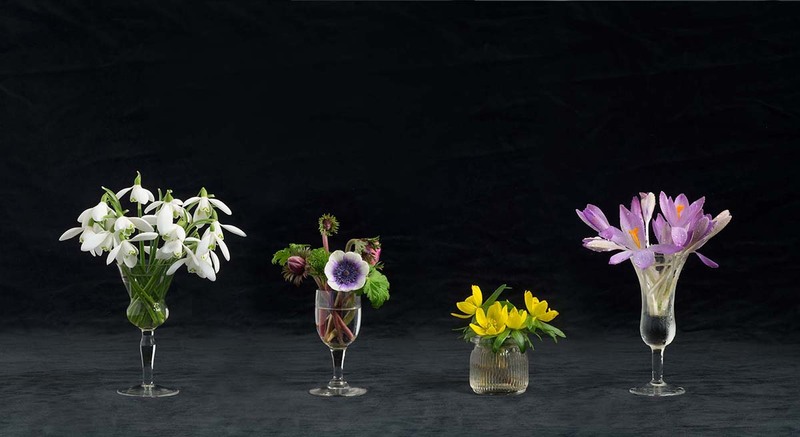 I constantly re‑arrange, recompose my floral tabletop shows. Wherever I go indoors, so flowers must go too, transported on trays from room to room so as not to miss a moment of their company. To delay their inevitable fading, my most fragile favourites are ‘put to bed’ each night, removed from warm fire‑lit rooms to the cool pantry. In recent springs my displays have been boosted by daffodils from a huge colony that unexpectedly resurfaced after we cleared brambles from the rough patch in the garden. Neighbours recall how Violet, the old lady who lived here before us, cultivated enough daffodils to bunch and sell every spring. The reappearance of Violet’s daffodils has been almost as good as meeting the lady herself. We’ve become almost acquainted through the flowers she favoured. Interspersed amongst her classic plain yellow King Alfreds, there are milky pale Ice Follies, little Jack Snipes, austere but dainty ivory-coloured singles and extravagantly fluffy‑headed doubles - old varieties whose names are untraceable. To Violet’s plantings I have added creamy jasmine‑scented Cheerfulness, purest white narcissi - Pheasant Eye and Actaea - the ones whose yellow stamens nestle in a crinkled crimson ruff. I arrange my flowers and Violet’s together in vases that have come to me from people I know well and from people I’ve never met. My vase collection is miscellaneous, some might say motley, but in it there isn’t one that doesn’t look as though it was custom-made to complement spring flowers. The hoard includes cheap, but long‑treasured, 1930s cut-glass flutes passed on from my grandmother; an antique Persian silver pair engraved with tiny hinds, hares and irises. According to family legend, these were ‘found’ during the London Blitz. Perhaps someone somewhere is still wondering where they are. Boot‑fairs have yielded red and green Victorian miniature posy glasses, a deep emerald Art Deco single‑flower glass and larger 1970s cylinders in dramatic turquoises and reds. The very tiniest bouquets of crocuses, aconites and violets look as good displayed in the 1940s cold cream jars and fish paste pots I salvaged from an old farm dump as they do in my grandmother’s minute antique liqueur glasses. Some of the vases are special mementos of people who have passed on. There’s my mother’s holiday souvenir - a fragile Bulgarian hourglass shape of sparkling crystal; and from a much‑missed friend, a weighty 1960s marvel of Czech Bohemian glass. The base of this amazing vessel swells into a cobalt‑blue mound dotted with points of white - exactly the colour of February’s heaven‑blue evening skies, pinpointed with stars. What drives my over‑the‑top spring‑time fascination with flowers? 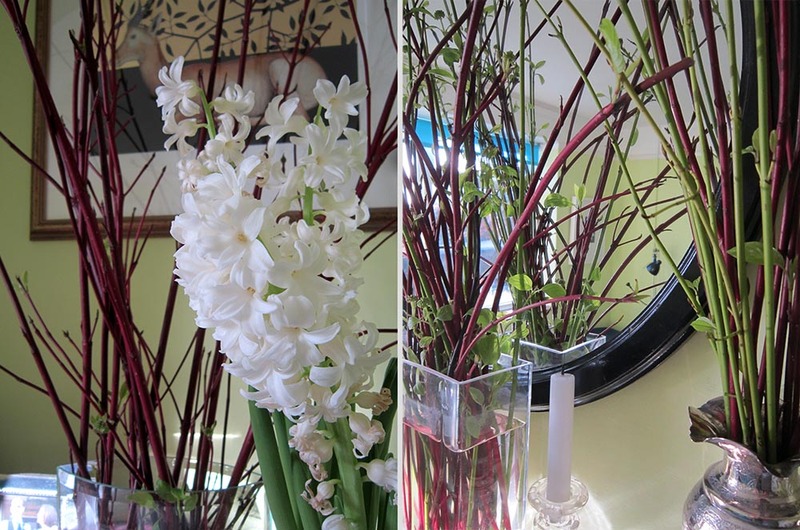 Why must I fill up the house with winter flora‑scapes? What’s it all about, this early indoor pseudo‑spring? Is it right to disrupt the natural order by moving flowers out of their places and enticing them to flower earlier than their appointed time? Purists might think my yearly phase of florimania is reprehensible - the equivalent of eating January asparagus airfreighted in from Peru. Could I be giving in to an impulse to sheer acquisitiveness? Do I, in an annual moment of madness, I become susceptible to a flower‑specific kleptomania and have to indulge an irresistible need, or greed, for floral possessions. Maybe it’s a reaction, verging on over‑reaction, my way of compensating for the garden’s flowerless mid‑winter state. Am I just impatiently wishing the winter away? It could be that I can’t tolerate winter without injecting shots of energising colour into the unremitting grey of sunless days. Then again, I might be falling for the clichéd idea that flowers ‘cheer you up’ at a dismal time of year. Possibly. I’m not averse to the idea of flower-inspired optimism. These are some of the reasons, but not all. When I put myself in the company of flowers, something special seems to be going on, something quite different from being satiated, soothed or cheered. Appreciating what is scarce and rare is all part of making a fresh start, deliberately turning the new leaf of the year. But this habit of mine is definitely not an attempt to accelerate the season, to hurry spring along just for the sake of thinking myself nearer to summer. Instead, I see this spring collecting and hot‑housing as the very opposite. It’s an attempt to slow time down and prolong the year’s most precious season. Being immersed in the lives of flowers is a way of relishing the short but nameless span of days between late winter and early spring. For me, anticipation, rehearsal, the re‑playing again and again of the opening of flowers has a value. Far from detracting from or devaluing the real thing, these indoor previews increase my appreciation a millionfold. When natural flowering begins outdoors, I’m primed and ready. There’s something else too - a way that the presence of flowers can transport me right out of the ordinary and carry me over a threshold into a special mental space. In that special space, flowers and I come alive to one another in particular ways. For example, I’ve learned to recognise a certain moment when the first forced daffodils look wide‑awake, vigilantly alert. For a while they take on a strange quality, verging on the animalic. I’ve noticed how the eye of every one stares fixedly at something invisible to me, something that only the flowers can see. Should they sense me looking at them, they make a deliberate show of focusing hard on something just beyond my view. Although I am convinced of their watchfulness, I can never persuade a single flower to meet my gaze. It’s as if each one is covertly keeping its wild golden eye on me, not that I mind. After all, I’m quite blatant about my monitoring of them. There is nothing unsettling or sinister about this mutual surveillance process - just pleasurable intensity in watching them, watching me, watching them. I don’t have a name for my flower‑induced, in-between state of mind. Not a trance, nor a daydream, nor an escape - it’s more like an unfamiliar sixth sense, a heightening of awareness. Whatever it is, it makes me super-sensitive to more than the physical forms of flowers themselves. In this state of mind, I find myself paying close attention to flowers’ counterparts - their pictures, shadows and reflections. When flowers are at their scarcest, such doublings and duplications matter. 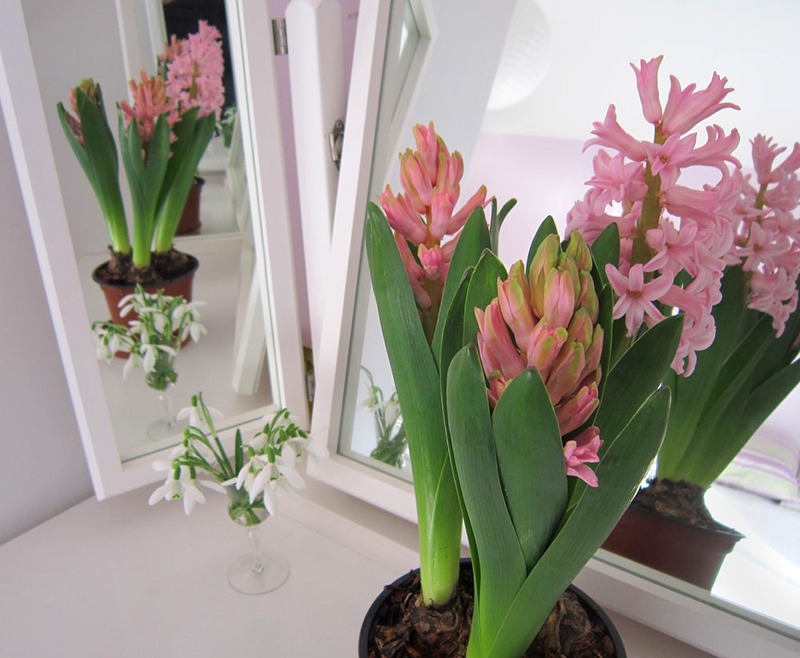 One kind of double comes as an accessory to the potted bulbs bought from shops or nurseries. While waiting for the flowers to appear, I study the illustrated plastic labels planted in the compost alongside the leaf shoots’ green nubs. These tiny flower photos have all the potency of votives. I take them as promises, templates foretelling the flower’s future form. Contemplating them is a way of wishing the flower into being. Other more mysterious doubling processes involve light and the casting of reflections and shadows. There’s an inherent magic in these: they can make much out of nothing. Over time, I’ve understood how to use them to make the most meagre displays go a very long way. It’s a matter of being watchful, observing how flowers react to subtle changes in the light, how they behave in front of mirrors. For example, a lone stem in a vase never stays single for long. 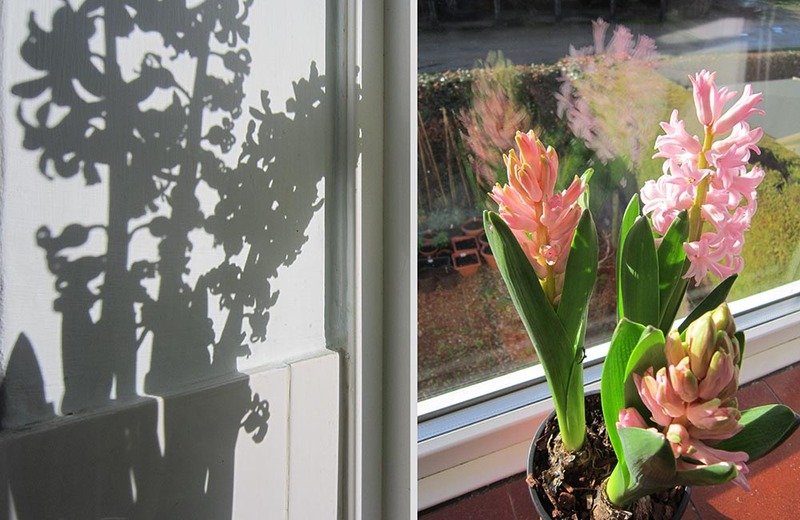 Even weak winter sunlight will disclose the existence of the flower’s distorted twin in the form of a shadow travelling and lengthening across the tabletop. 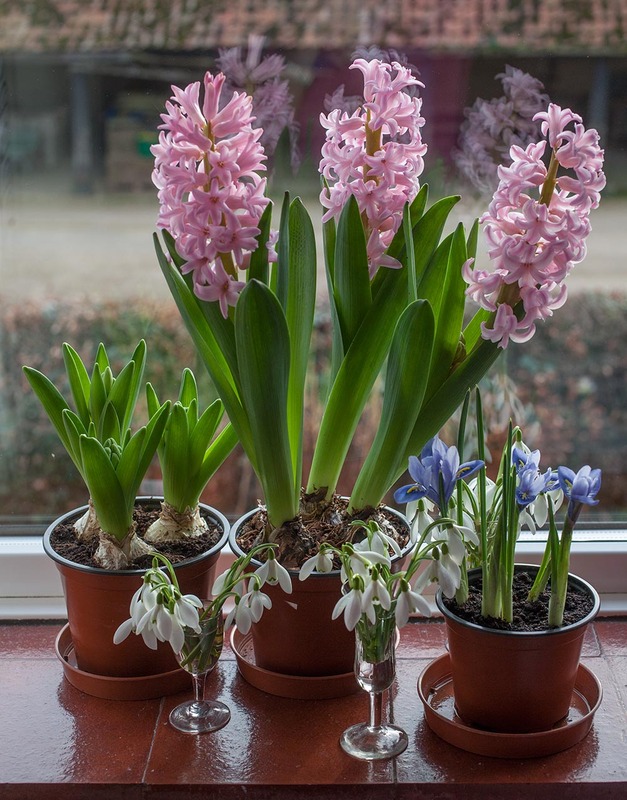 Similarly, a hyacinth stationed in the angle between a double‑glazed window and a plain wall takes quadruple form when caught in the hex of light. The flower itself is never unaccompanied. Look closely and you’ll notice the presence of its insubstantial consorts - not just the monochrome shadow creeping like a furtive ghost across the wall. There is also its coloured reflection, its two‑fold twin, mysteriously suspended within and yet outside and beyond the double‑layered glass. At night, flowers can repeat the very same trick that gem‑like fairy lights perform. As it falls onto glass, lamplight transforms the room into a makeshift hall of mirrors in which each flower competes to cast its reflection. The surfaces of night‑black window panes, vacant TV screens, and picture frame glazings are places that flower‑doubles favour for making their special nocturnal appearance. They can’t even resist the temptation to see their own faces reflected in images of the faces of the dead. In reflections of reflections they multiply, doubling and re‑doubling themselves. When intricately tangled twig‑shadows pattern every wall and the flowers’ shining reflections come alive, it feels as though private interfloral messages are being communicated, from one stem, one branch, to another all around the room. Knowing how the properties of reflection and multiplication work, I deliberately set up meetings between mirrors and flowers. Lining up sparse arrangements close to or in‑between looking-glasses produces the impression of great profusions of flowers. There’s something intriguing about being able to see two views or versions, back and front, of a thing at once. Reflections reveal far more than back views. Elusive floral flipsides and equivalences show up in the through‑the‑looking‑glass world. A flower that reaches amenably into the room towards me simultaneously leans away, as though deliberately turning its back on me and retreating, aloof, into the mirror’s mysterious depths. Seeing them looking two ways at once like this heightens the sense that they are coming and going, arriving and departing all at the same time. This capability, that only the subterfuge of the mirror can disclose, reminds me of Janus the two‑faced Roman god of beginnings, dualities, gates, doorways, passages, transitions and endings. 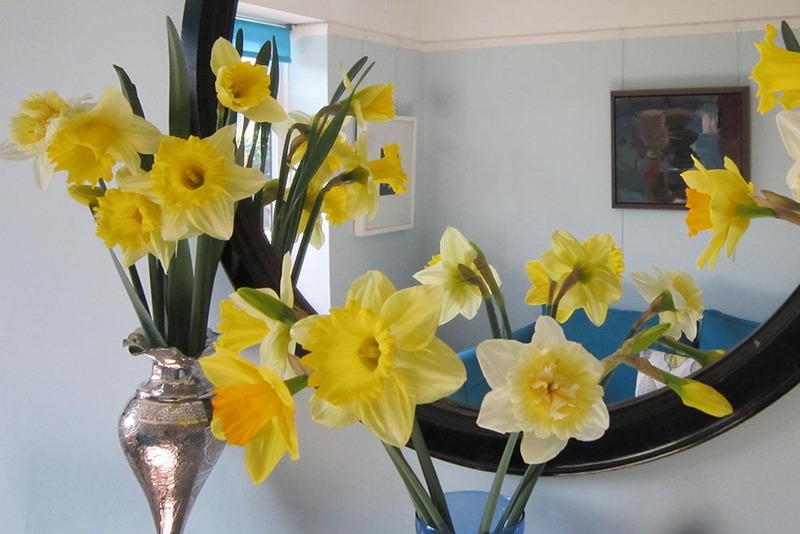 Because flowers are so deeply implicated in arrivals and departures, obverses and inverses, celebrations and memorials, I like the idea of Janus choosing daffodils as proxies to help him put in a timely new year appearance in my mirror. On the week of crossover from February to March, there’s an obvious quickening of pace, everything growing noticeably faster and thicker. On my walks, I can see and feel spring gathering force. Right there at my feet, there’s a surge of green, a profusion of leaves and petals increasing, expanding, unfurling. Without warning the daffodils turn pandemic, suddenly dominating the wood and the garden, their yellows and golds burning like a flameless floral wildfire amongst the tinder of last year’s dead bracken. In certain woods in this part of Suffolk the wild daffodil variety, known as Lent Lilies (Narcissus pseudonarcissus), grow rife as weeds. There is something endearing about a flower whose Latin name is so very contradictory - a genuine narcissus that is simultaneously a sham narcissus, a coy but ravishing beauty with not quite enough self‑confidence to indulge in true narcissism. With shorter stems and much paler creamy petals than the showy cultivars, these tiny daffodils are tough and resilient, and yet so diffident. Their all too brief flowering time follows that of the snowdrops, and coincides with the blooming of the white Spring Snowflake. The three flowers are relatives - all members of the lily family. This idea of relatedness between three of the earliest spring flowers appeals to me because they all bloom at a time of year which, for my family, has special associations. Their flowering happens at a time when anniversary days crop up more often in the diary giving more reasons still for my springtime bouts of floraphilia. I was born on March 15th, a date that my grandparents half-teasingly taught me to name in a very specific way. I must have sounded so precocious as a six year old when some long‑lost great-aunt or schoolteacher asked “When is your birthday, dear?” and I would unhesitatingly, and innocently, reply “The Ides of March”. I am from the kind of family who know nothing at all about classical history or serious literature. I had no idea that the date was the unluckiest day of Caesar’s life until reading Shakespeare for an A level. I’ve since learned that in the pre‑Julian calendar, March was the first month of the year, and from the 1st until the Ides on the 15th, the Romans celebrated their new year. Their tradition of a two week celebration of the new year is a better one than ours. There’s something flawed and unrealistic in our idea that the stroke of midnight is the transformative moment when this year becomes last year, and next year becomes this year. In reality the process of finding ways into the new year is not instantaneous: it takes time. My birthdays have always involved an excess of celebratory spring flowers because my parents’ wedding anniversary also fell on March 15th. The date really was a special day of new beginnings in the family. My mother often took playful delight in watching peoples’ expression when she told them of the coincidence of dates. She would wait a second or two before saying “No, I didn’t have her at the altar - she arrived two years later!” From the Ides of March, until about a week later - up to the vernal equinox and Mothering Sunday - our mantlepiece was always overcrowded with a mixture of birthday and wedding anniversary cards, and of course the day was celebrated with special guests - bunches of daffodils. Since coming to live in this house, whose garden abuts a copiously snowdrop and daffodil‑rich wood, I have begun two clandestine flower‑picking traditions. Every March 14th, despite knowing that I really shouldn’t do it because my own garden is thick with daffodils, I creep into the wood after dark and pick as many half open buds as I can carry so that on the morning of my birthday I wake up to a houseful of them. 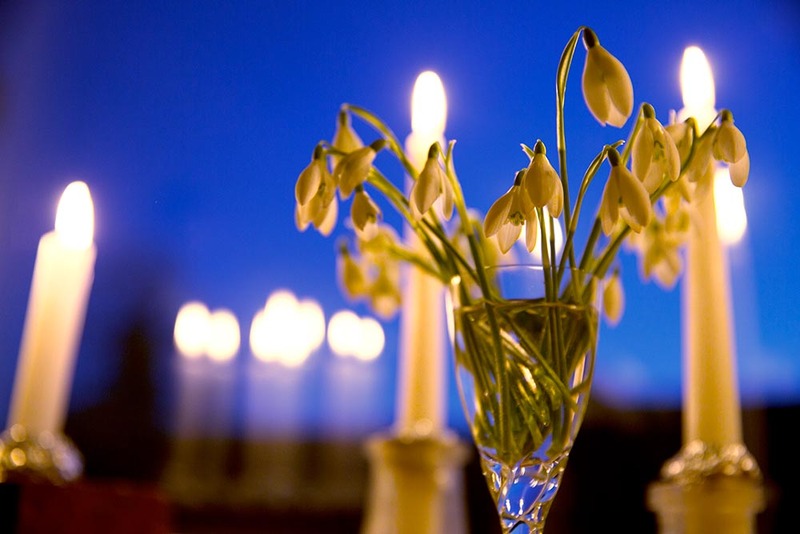 These March 14th flower-picking extravaganzas have become a way of remembering relatives, marking connections between the dates of marriages and births and deaths, making links between people and flowers and between good days and more sorrowful ones. So too is my more recently instituted annual snowdrop‑picking rite. February 2nd, Candlemass, is the only day of the year that I bring these flowers in the house. My reluctance to pick them on any other day is partly because my mother told me that it is unlucky to bring them indoors, and partly because they now recall another close relative’s brave fight against illness. In 2016, when it still seemed just possible that he might recover, the snowdrops made their appearance. It was then that I stumbled by chance on the tradition of Candlemass which involves bringing both snowdrops and candles into church. Traditionally the candles blessed in church on Candlemass day had the symbolic power to protect against illness and famine. The waxy buds of snowdrops resemble tiny white candle flames - appropriate for a flower involved in a late winter festival of light and protective safeguarding. It wasn’t that I was credulous or that I superstitiously thought that following an archaic tradition might magically effect a cure. How could flower‑picking succeed where chemotherapy was failing? But I wanted to use the Candlemass flowers emblematically. Explaining to my relative what they stood for gave me a fresh way of reminding him that the possibility of recovery was still there that spring. Even though I knew it was illogical, I hoped that snowdrops which were direct descendants of flowers used in the Abbey’s Candlemasses here nine centuries ago might have some specially potent power, not to effect a miracle, but to carry and reinforce my message. And they did help to keep hope alive for a while. Now the snowdrops that I bring in and arrange in tiny vases amongst clusters of lighted candles resurrect a fading tradition and refresh my memories of the relative I lost. It’s strange how in the last couple of springs, the transition from snowdrops to daffodils has exactly coincided with his birthday on March 4th. Image: P. F. White/FXP Photography, 2016. H. E. Bates noticed that the transitions between seasons are never decisively clear‑cut: there are moments of fusion between them. Any season can spread into or be juxtaposed over another. Bates saw how spring never progresses in a straight line. It arrives not just in incremental advances, but also via unexpected detours, repetitions and odd entanglements. He saw May and June, early summer, as ‘a kind of second spring ... sunny and snowy, hot and frosty, bright and dark by turns’ and noted how ‘Autumn slips a finger into August, but Spring has a revenge in December’ 1. For me, that same sense of seasonal expansion - overlapping and overspreading - is repeated in the way that springs are spread out one by one through a lifetime, and conversely, in the way that individual lifetimes spread and extend through the unfurling of successive springs. Bates is right, the spring, whenever it occurs or re‑soccurs, is the loveliest time of the year, and this is why it’s worth prolonging and enjoying every moment of it. Whether the flowers come in wild or tended places - as feral trespassers in the garden or as cultivars who have absconded to the wood - their yearly time overground is so short in comparison to the portion of their lives spent underground. It’s the very transitoriness of their annual comings and goings that has the power to evoke the presences of people, objects, places and times. Being between or amongst flowers is a way of reminding myself of who I am, who and what is here, and who and what is not. Bates, H.E. 1936. Through the Woods: The English Woodland - April to April, Covent Garden: Victor Gollancz. p.99. Unless otherwise acknowledged, all material is © Kim Crowder and may not be reproduced or copied in any form without written consent.